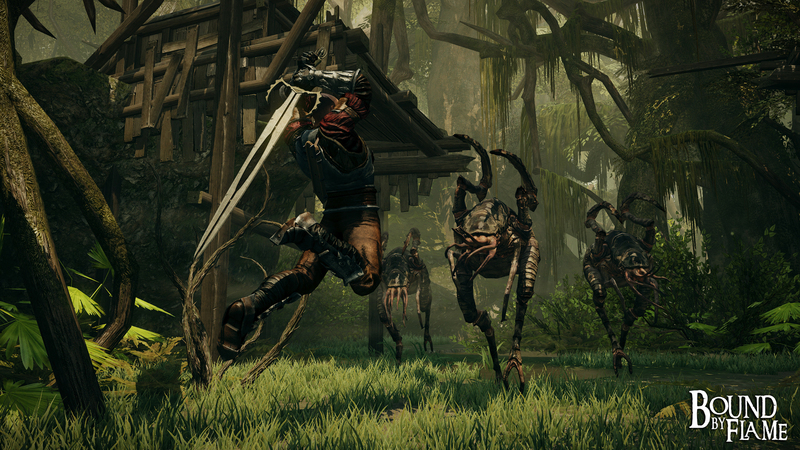 Bound By Flame is an Action RPG game developed by a small studio called Spiders. It has its ups and downs but nonetheless is worthy of your precious gaming time. The game is about the struggle between humanity or giving into the demon in order to gain new powers to save the world of Vertiel. I chose the Buffalo difficulty – the second hardest. After the opening cutscene I was taken to character creation. The character model looked great but unfortunately, you don’t get a broad range of face and hair options. Once in the main game, you’ll meet the Freeborn Blades, a group of mercenaries who join you on your journey to rid the world of Vertiel from the Ice lords – evil magicians who have taken over the world and covered it in a massive pile of snow. Bound By Flame is typically full of ‘go to point A, then move onto B’ quests which range from killing enemies to fetching items. The game is good-looking, though the environment does not change until half-way through, when it shifts from an orange mountain temple, to a green jungle, to a white frost palace kingdom. Sadly, the game locales were few. Each weapon has its uses. The sword, for instance, enables you to parry, creating an opening which allows you to get one or two hits in before the enemy recovers. With the daggers, however, you are able to dodge and administer more strikes due to the speed and swiftness of movement. These weapons can all be augmented with the skill trees present in this game, of which there are three: Warrior, Ranger, and Pyromancer. Each tree offers a unique play-style. I decided to focus mainly on the warrior class as I wanted to deal damage through the use of a heavy weapon (sword, axe, or hammer). After spending some time playing, I eventually collected enough parts to craft my weapon and armour and turn them into something of a force to be reckoned with. Weapon parts can be swapped out – changing the head or the pommel, for example, not only adds a visual difference but also adds extra benefits that could mean you deal more damage or become better at resisting an element. That said, the customizations all appear the same for every weapon, therefore you see the same pommel or head on your sword, hammer or axe. As you can imagine, the repetition wears thin. Each companion you recruit has abilities that aid you in battle, from healing magic to providing range and close quarters support. They all have their own little back story which contributes to world lore. Each companion does play a key role when it comes to making choices that ultimately impact the outcome of the story, whether it affects the player directly or the world around them. If you want to survive in this game, the important thing to do is figure out which weapon stance works against an enemy. Sure, you can bash the attack button for all it’s worth, but you will definitely not get far on the higher difficulties. Health and damage are the only two variables that make the difficulties different. So the challenge is only in staying alive as the enemies do not become smarter or increase in number. I would definitely have liked to have seen the enemies scale to your chosen difficulty. Touchpad controls do not work 100%, – There seems to be lag sometimes and on occasion have to swipe 2 to 3 times. Better not to use the touch-pad just for the sake of it. Hot keys do the job perfectly. If you’re desperately looking for that Action RPG fix, Bound by Flame will provide a repetitive one with a story and stylish visuals. The gameplay is nothing new or special but it is challenging when played on the highest difficulties.